Hearty, comforting and delicious, Crock Pot Sausage & Chicken Cassoulet is an easy version of the classic French dish. Cassoulet is a French dish, slow-cooked with white beans and an assortment of meats and is named for the earthenware pot it’s traditionally cooked in, the cassole. 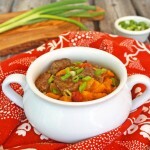 My version contains smoked sausage and chicken and is made in the slow cooker. 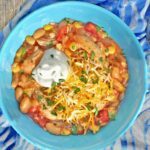 This Crock Pot Sausage & Chicken Cassoulet is another family favorite that I’ve adapted from Southern Living’s Slow-Cooker Cookbook. I’ve tweaked the ingredients and have added chicken to lighten it up a bit and also since my son has yet to acquire a taste for smoked sausage. 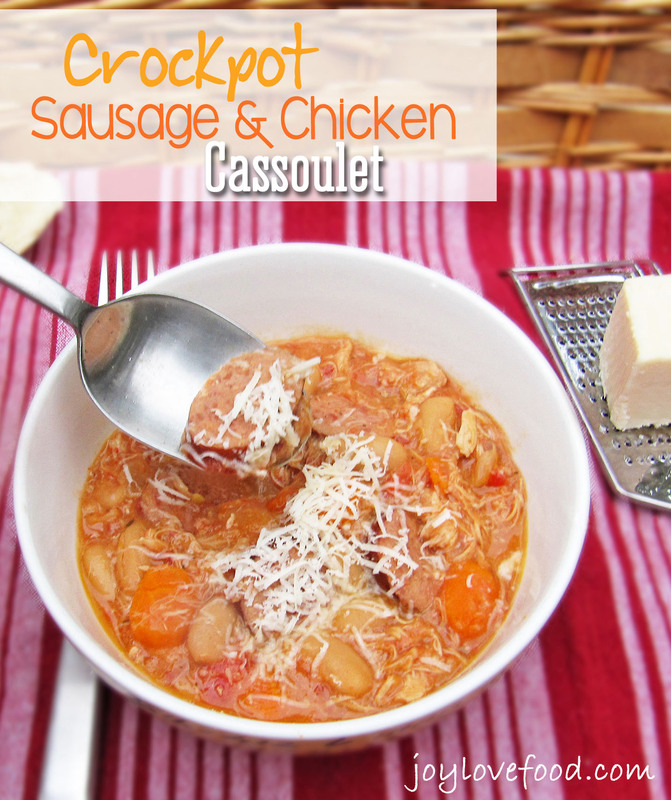 Crock Pot Sausage & Chicken Cassoulet is a quick and easy dinner, that I love to throw in the crock pot in the morning, when I’m expecting guests for dinner, but am not sure when we’ll be sitting down to eat. It’s perfect for when my parents and in-laws are coming to visit; it simmers away all day in the slow cooker, making my house smell so delicious, and can be kept warm for hours. 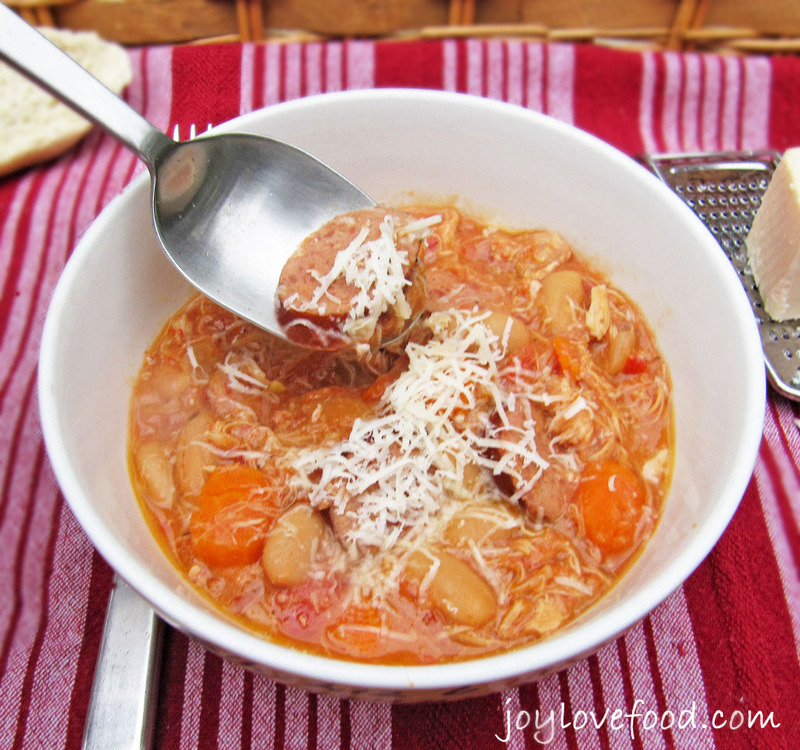 I always get raves every time I make this Crockpot Sausage & Chicken Cassoulet, all three kids love it too. It is so good, how can you go wrong with anything containing smoked sausage? Yum! Trim fat from chicken thighs and place in 6 quart slow cooker. 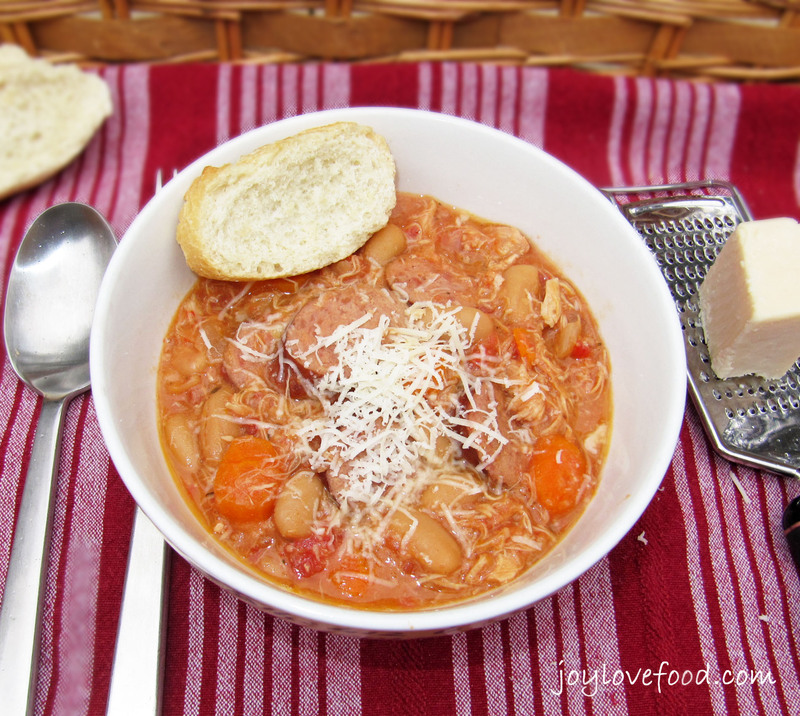 Add smoked sausage, onion, carrots, garlic, cannellini beans, diced tomatoes, thyme, salt and pepper to slow cooker. Pour chicken broth over mixture in slow cooker. Cover and cook on LOW heat for 8 hours or until chicken and vegetables are tender. 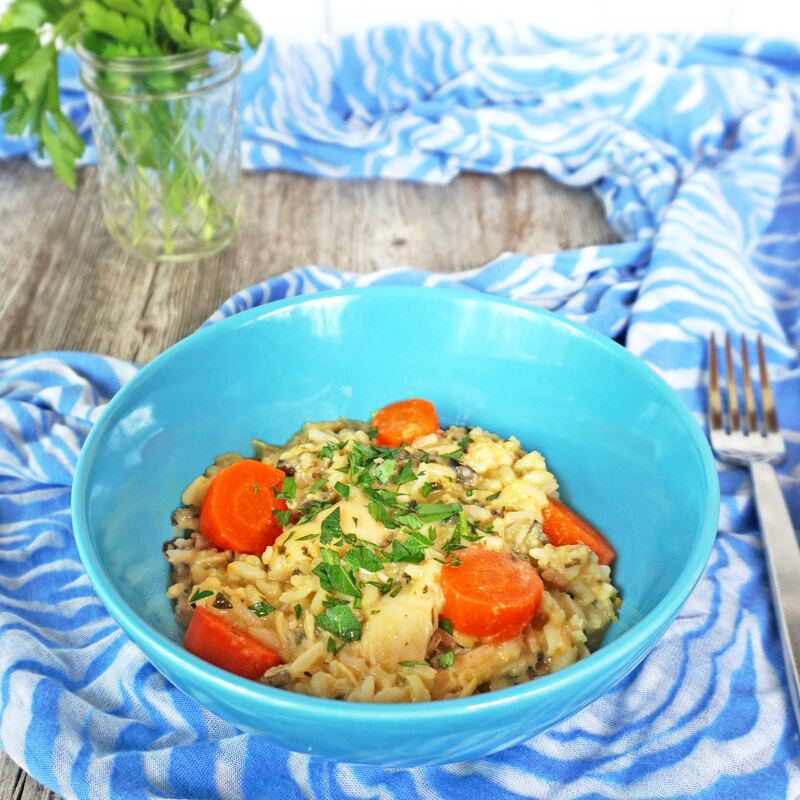 Using a slotted spoon, remove chicken from slow cooker and place on cutting board. Shred chicken with two forks and return to slow cooker, stir to combine. Serve and top with freshly grated Parmesan cheese if desired. 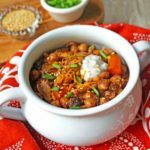 This entry was posted in Crock Pot / Slow Cooker, Main Dishes and tagged carrots, cassoulet, chicken, crock pot, sausage, slow cooker, white beans. This looks so yummy! thanks for linking up at Totally Terrific Tuesday 🙂 Pinned! Cant wait to see what you brought this week!! Perfect comfort food. And I like that it is made in the crock pot. There’s just something about coming home to delicious aromas when it’s cold out. Thanks for sharing with See Ya in the Gumbo. 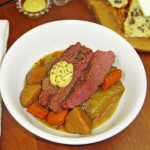 MMMMM I have not had a good cassouslet in YEARS! This looks really fantastic!!! 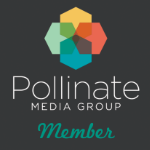 Thanks for linking with us at #Foodie Fridays!! Thanks Mila! Thanks for coming by! Thanks Vashti! Hope you give it a try and enjoy! Hi, thanks! I use chicken thighs, I’ve updated the instructions, thanks for the catch! I hope you give it a try and enjoy! Natasha in Oz recently posted…Pecan Pie ~ A Treat for Thanksgiving & My for Birthday! Thanks so much Natasha! Thanks for coming by! Oh my goodness! This looks delicious! 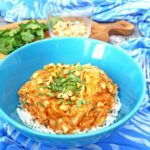 I’m always looking for good crock pot meals! Found you from Friday Feature Linky party! Thanks Jana! Hope you give it a try and enjoy! Thanks for coming by! Forgot to mention pinned for later! 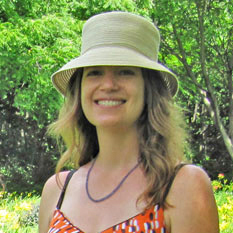 Hi Theresa, thanks so much, hope you give it a try and you and your husband enjoy! Thanks for coming by, I will definitely be back at My Favorite Things! This looks delicious Joy! I know I’ll be trying this soon. Like Zan my Mr. loves sausage. Thanks for sharing your recipe at the party. Drop by anytime! Hubby loves sausage – I really never buy them anymore because I never seem to know how to cook them. I bet he will enjoy something like this with the chicken mixed in! Hi Zan, hope you give it a try and enjoy! My husband and kids love this and it’s so easy! !